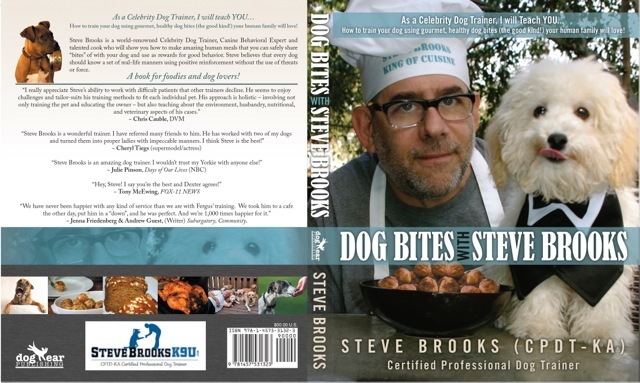 As a Celebrity Dog Trainer, Steve will teach you how to train your dog using gourmet, healthy dog bites (the good kind!) your human family will love! Steve is a world-renowned Celebrity Dog Trainer, Canine Behavioral Expert and talented cook who will show you how to make amazing human meals that you can safely share “bites” of with your dog and use as rewards for good behavior. Steve believes that every dog should know a set of real-life manners using positive reinforcement without the use of threats or force. You can also buy the book online at Amazon or Barnes & Noble. Perfect for Foodies & Dog Lovers! Professional Dog Trainer, Steve Brooks (C.P.D.T. /K.A.) shares secrets to modifying canine behavior without the use of threats or force. 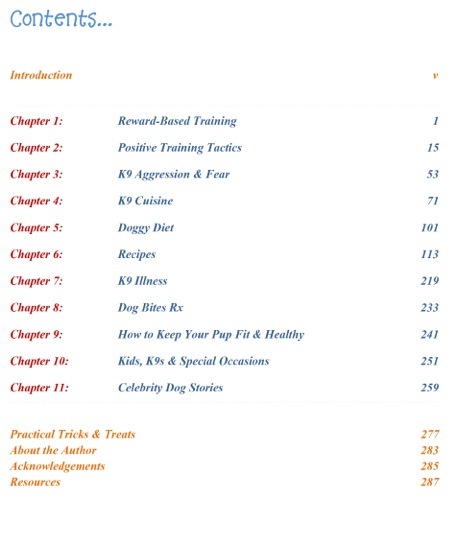 Discover HOW to train your dog using gourmet, healthy dog bites (the good kind!) as rewards for good behavior! Steve Brooks is a master at creative, positive, science-based reward training methods with terrific results and has been training dogs for over 20 years using “dog bites” to correctly train thousands of dogs with lasting results. DOG BITES with Steve Brooks uses food as an effective training tool. In this book, you will discover what is safe and unsafe to feed your dog while learning how to modify your favorite meals to share with your pup! While Steve cooks recipes from Organic Turkey Meatballs, Sweet Pup-Tato Fries to Chicken Pup-Pie, he shares what is safe and delicious for canine consumption. He also demonstrates the health benefits and dangers of many human foods. Featured as a dog training expert in Marley & Me (Blu-Ray DVD), Steve shares stories of celebrities with the same issues we all encounter and will teach YOU… How to train your dog using dog bites (the good kind!) your human family will love! Contrary to popular belief, FOOD can be the best way to build trust and bond with your four-legged family member! Teach your dog to: walk without pulling on the leash, come, stay, tricks…and more! Train your dog to take food gently right out of your hand! Even if you don’t have a dog, this book is filled with tasty, amazing and healthy—even vegan—recipes your human family will adore! Steve Brooks is a world-renowned Certified Professional Dog Trainer (C.P.D.T. /K.A. ), Canine Behavioral Expert, and talented cook who will show you how to make amazing human meals that you can safely share “bites” of with your dog as rewards for good behavior.